Good morning friends! 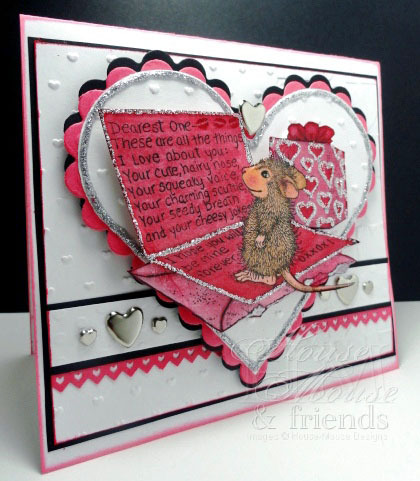 Welcome back to another House Mouse & Friends Monday Challenge! I am very excited you are here. We are overwhelmed by the number of entries! And if you guessed that I had hidden Prizes, you were right!!! I was hiding the (100+ Charms) & the (House Mouse Valentine Stamps! :) I know, sneaky, right? heheh ! Gosh, it's been really tough having to choose just 2 winners for these prizes! Wish I could send you ALL a little something! A BIG HUGE CONGRATULATIONS TO YOU BOTH!!!! Im so happy you have played along to have won! Please contact me with your ADDY info ASAP to claim your prizes! This week's NEW challenge is being hosted by our fabulously talented Heather, of Rica's Haven and she wants us to create using EMBOSSING techniques. 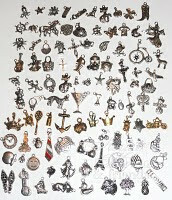 Any type of embossing will do as long as you use some type of House Mouse & Friends images on your projects. 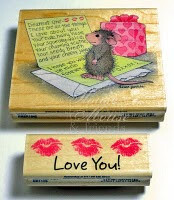 Stamps: Stampabilities, House-Mouse Designs, called "LOVE LETTER", from 2009, # HMKR1042, and features Muzzy. Some Odd Girl.. Lets get Embossed.. Thanks for stopping by today! I so LOVE hearing from you! Beautiful card, America! Love the silver hearts and the embossing looks gorgeous! love the hearts and the colors you have used. Hi America!! gorgeous card, such a cute image, love the fantastic embossing and punching and brads so beautifully co-ordinated. A really gorgeous creation America, I love all the hearts and such a fab image. Just couldn't be any more adorable than this! Good use of those embossing folders and all the details are just wonderful. Thanks for joining the Stampin B's die cut challenge this week. This is simply wonderful! The image is so cute and you did a fabulous job in coloring it. wow gorgeous, thankyou for joining us at CES cvhallenges. I love this image, sure hope it is going to your sweetie...Love the colors and the embossing..ah, such a romantic!!! I mailed my winner's stamps off to her in the UK this morning, she was thrilled to have won! I love your card! I have the same stamps and I can't wait to try this! I swear I buy the stamps just to look at them! I have to start to get on with the "make" part of it all! Love it!!!!!!!! Hi America! 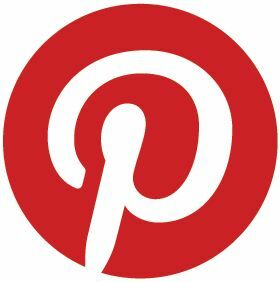 It was soooo good to see you on my blog today! I hope you are doing well! I just love seeing your HM cards... I have a special place in my heart and a whole drawer of HM images going back to the 90's! So I always love seeing your gorgeous creations with these adorable images! This is so cute.. one I have not seen before! Great job as always! Hi America what a gorgeous card I love the colour theme & the image is fabulous. Thankyou for joining us girlies at CES Challenges, good luck hun. Wow, your card is so cute. Thanks for joining with us at Totally Gorjuss this week. Adorable card! Thanks for joining us at Meljen's Designs this week! So pleased you could join us at Totally Gorjuss this week - hope to see you for our next challenge! What a stunning creation, from colors to image, just amazing! How adorable!! Love everything about the card! Such a sweet image and coloured so beautifully! Wow! This is the cutest!! I just love the coloring and the silver hearts and embossing. Usually I am stanch against these colors together, but you really made them work! SO GREAT! And the detail and dimension! Thanks so much for playing with Some Odd Girl! love the sparkle on the edges! Thanks so much for playing with Some Odd Girl's embossing Challenge!! This is so adorable! Love that stamp and the design! 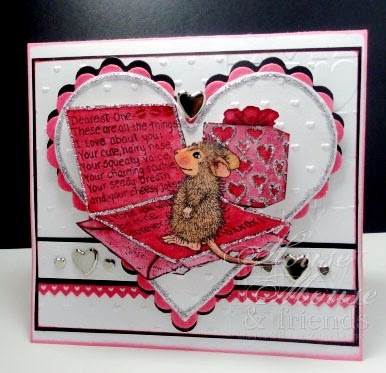 great card, love the hearts and embossing! I don't know how you do it, but your cards are always amazing, week after week! Love all that extra touch glitter! to washing them. * four. It's also an amazing spot to locate astounding gives and quite low rates on these footwear. The grooves about the outsoles make confident that which you can arrest slides effortlessly and stroll effortlessly. For ladies and gals, just take your select from 'Fireworks' types to floral designs and pastel shades. look ideal together with trousers concealed throughout or perhaps dresses. Naturally, if you are looking to get a style that combines the regular seem with a twist for the tiny ones, it is feasible to choose UGG youngsters crochet footwear. The actual adorable crochet style absolutely can boost the seem of one's kid. Both novice and seasoned marketers could have tried affiliate marketer failed in the end. There is the threat of folks target the internal aspects inside of their Affiliate organization, what really raises it are now the external aspects. There are many who who desires to interfere with affiliate advertising on the internet can not obtain this process entirely due to the fact have a appear at some ordinary elements.